It has long been said that oatmeal is good for lowering bad cholesterol. I don’t know if that is true or not, but what I do know is that a bowl of oatmeal on a cool, crisp morning is comforting to the soul. My love of oatmeal began when I was pregnant with our son. It’s what I craved 24-hours a day, accompanied by mega amounts of chocolate milk! Don’t judge…it kept me sane. 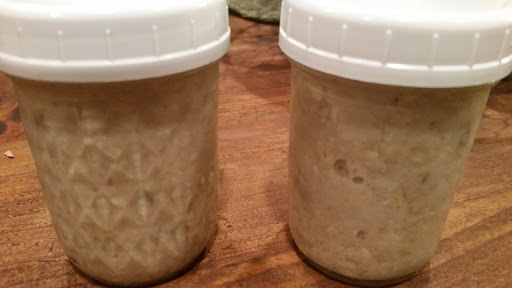 This recipe is for an overnight oatmeal….it’s uncooked, so all the vitamins and minerals are still there. Before you go, “yuck”, you really need to try it. I doubled the recipe so we could each have one. After it is mixed well, place into a covered container, or an 8 oz jar as I have done. Place it in the refrigerator overnight. In the morning, it can either be eaten cold or heated. Sprinkle with a little extra cinnamon and a few slices of banana and breakfast is served! You can use any combination of flavors you like. The base recipe will be the same.